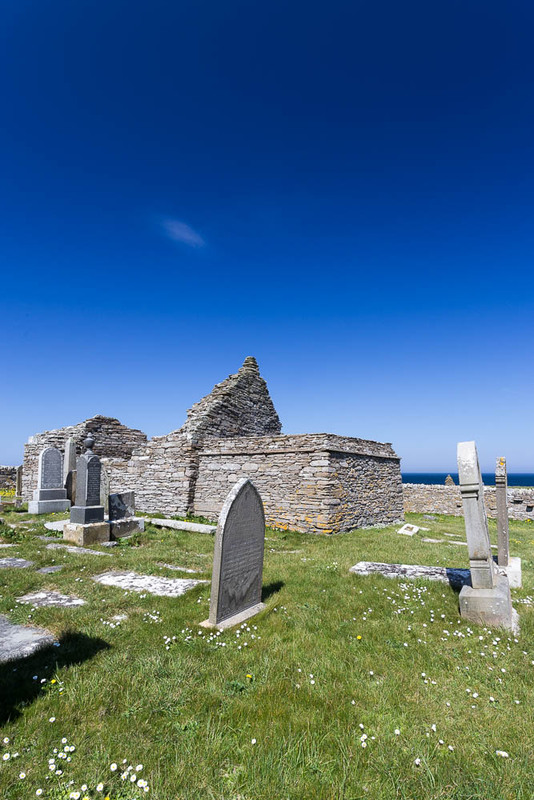 Just up the coast between Thurso and Dounreay lie the ruins of St Mary’s Chapel, set back from cliffs overlooking the Pentland Firth. It’s about a mile’s walk from the road: you go along a track and then slither down a steep path to the valley floor where a river tumbles over rocks before spilling into the sea. You cross the river by a footbridge and clamber up onto the cliffs on the other side. At the top the land falls away and you see the whole vast heaving ocean spread out before you. It’s a stunning location, and you’d get a real feeling of isolation and atmosphere if someone hadn’t carelessly plonked a bloody great technology park next to it. Still, you can always turn your back on the future and lose yourself in the past—it’s what I do for a living, after all. It’s the oldest building in the north Highlands, though no one knows how old: maybe 12th century, maybe 9th. Only the nave survives from the original chapel, as it was substantially rebuilt in 1871. In other words, it keeps its mysteries: and that feels entirely appropriate. To walk there now under the burnished sun, hearing the crash of the waves on the rocks far below, gulls riding the wind as through straining to an invisible leash, at the wrong end of God’s microscope, it doesn’t just seem right that there’s a place of worship here: it feels inevitable. 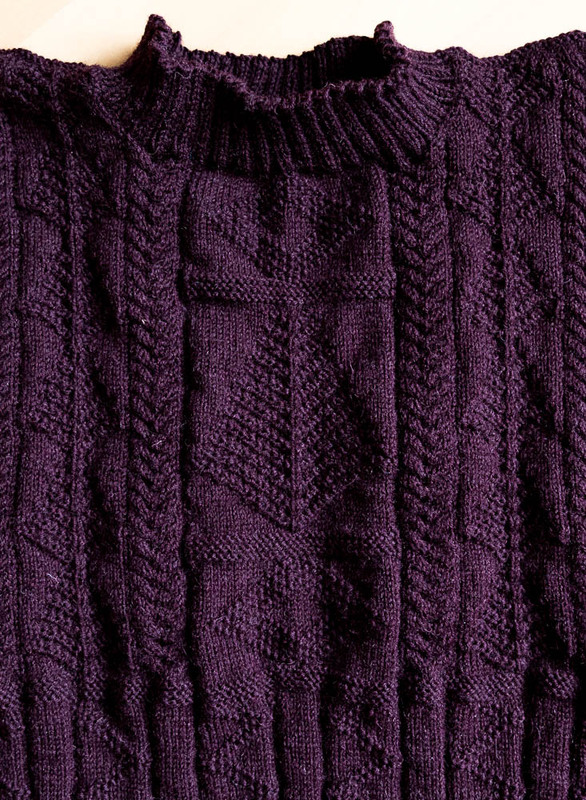 In parish notices, the ganseys keep on coming: this week I’ve been sent pictures by Elisabeth of a splendid and unusual gansey featuring cables and a lattice pattern (more photos on her Ravelry project page). Congratulations to Elisabeth on a striking and original design! 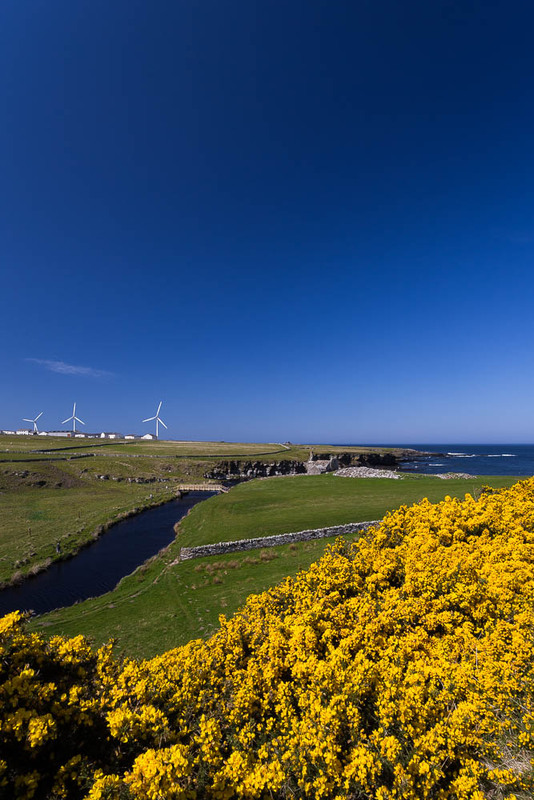 Finally this week, I attended a job fair for the nuclear archive and got talking to a gentleman who used to work at Dounreay, the nuclear facility just up the coast from the chapel. He told me a great story. One time, a team of four or five guys were tasked with cleaning out an installation; it was a totally enclosed space, so they had to wear ear protectors, which also served as headphones. One of the guys discovered they could all be hooked up to a walkman, so they could all listen to the same music at the same time. So they put on a tape of Jeff Wayne’s classic album of The War of the Worlds and got to work, singing along. The supervisor came in unnoticed at the point on the album when the Martian war machines utter their famous war cry, “Ulla! Ulla!”—whereupon the guys all joined in, shouting, “Ulla! Ulla!”—totally freaking out the supervisor, who of course was unable to hear the music. All he saw was a bunch of busy guys suddenly pausing in their work as if at some signal, raising their heads, and shouting this strange cry in unison. And all this in a nuclear research establishment, too; he must have felt he’d stepped straight into an episode of Doctor Who…! Oh lovely work, Gordon. What a rich and intricate pattern this is, and the damson colour so right! And you have picked up the stitches. I don’t mind picking up stitches too much, but it does interrupt the flow. I must be slow! It is another mystery gansey, isn’t it. I can understand completely the need for a change, I think all knitters do it! Wonderful photos of your countryside! Take care! Hi Jane, if offered the choice of having a tooth drilled or picking up stitches, I’d go for the tooth every time! But knowing that both sleeves are now picked-up is a huge relief, and I can just enjoy the next few weeks. What a rich and stunning colour that damson is! I think I see a gansey in that shade in my future ….. Or maybe pewter …….. or maybe heather blue ……….. or maybe clotted cream ………… or …………….! Hello Lois, well, I suppose there are about 30 colours in the Frangipani range, and about 5 or 6 in Wendy’s, so you have a lot of alternative futures to contemplate! The new gansey looks fine ! Are you knitting two garments again at the same time ? May I ask if you have ever considered, Gordon, that there could be a lovely pamphlet in all these Gansey patterns! Seriously, if I actually get around to doing this, you’ll read it here first! Gosh! I sensed a ” plan, Stan “, very interesting. I like the idea of a Christmas Annual! Take care! I envisage a Christmas annual with crosswords, quizzes and a “join the dots and recreate a popular gansey pattern” competition! Count me in as a future subscriber to your ebooks on ganseys. 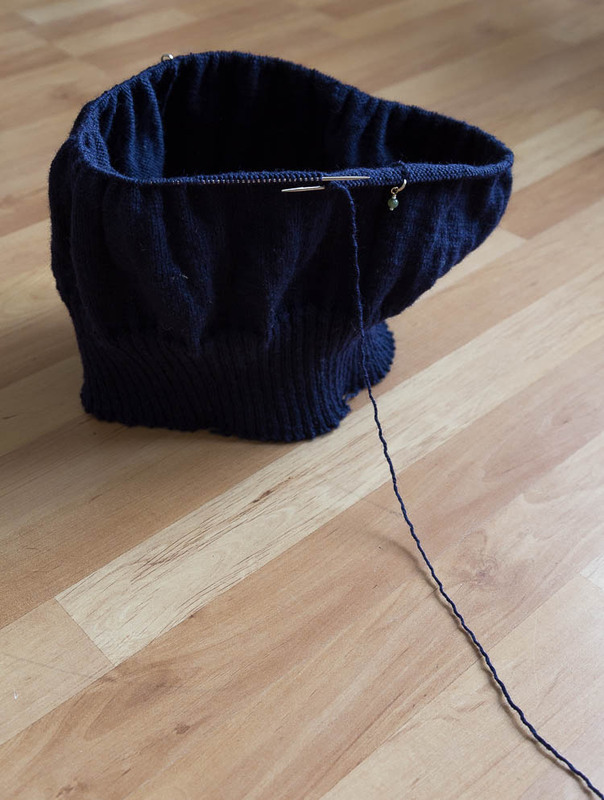 What should I knit next after I finished my Hebridean gansey, Gordon? Maybe one without too much pattern so I can watch the Shetland mystery series at the same time. I do love the pattern on the Ferguson gansey. Lovely! Hi Jenny, what sorts of gansey patterns do you like? You see, for me—and it’s just a personal thing—there are three main types of patterns that really appeal to me. Firstly there’s the Yorkshire (i.e., Filey-Flamborough-Whitby) ganseys, lots of cables and diamonds; then there’s the very plain Cornish ones, like The Lizard or the Vicar of Morwenstowe, where the alternating of plain an moss panels makes for a very effective English-fields-seen-from-a-Spitfire sort of effect; and finally there’s the very intricate Hebridean/north of Scotland baroque wedding cake ganseys. So:§ what sort of patterns do you like the look of? Gordon, I am sort of like you. My heart belongs to Yorkshire ganseys too. And no, you’re not being shallow. You’re “keeping the faith” when it comes to knitting ganseys. And Gladys does this to you each time you open her book. I’ve done several ganseys and the most intricate one was the last one that I just completed. I sort of said that was the equivalent of a Ph.D. in Gansey knitting. I’ve done a Flamborough, a few Fileys, Whitby, Scarborough, Scottish Fleet, Inverness, Mallaig, Lerwick, and a couple of Hebridean. Like you I look at other resources for inspiration but I keep on going back to Gladys. Now, I’ve never done a Polperro and on p.58 of Mary Wright’s book, there is a photo of a young lad wearing a ribbed knit-frock. It doesn’t have a defined collar. I can’t tell if the welt is 2-2 rib then plain knitting then ribbing again all the way to the neckline. Is this a gansey? And p.30, William Henry Laity’s photo shows him wearing his gansey with similar construction as the one on p.58. But it appears this one has a defined collar. So let me do a bit of reading on Cornish ganseys or I might venture a bit farther and do a Dutch one. 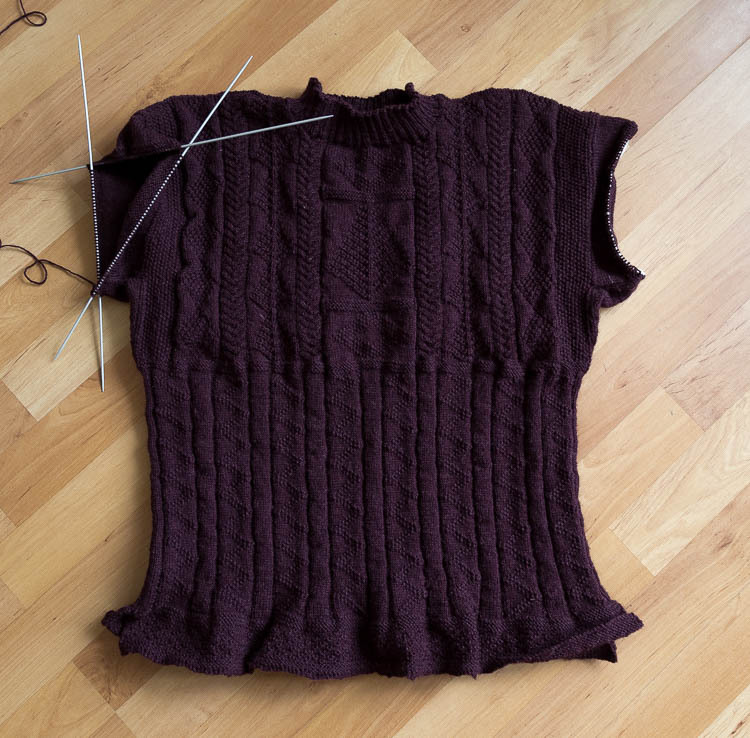 Hi Jenny, I looked up the photos you mention in Mary Wright’s book and i see what you mean – I’ve seen that k2-p2 pattern in other photos, basically making the body pattern like a welt, usually described as “plain working ganseys”, with the advantage that it naturally pulls in but can expand easily as you move. What Inverness pattern did you go for? Nothing wrong with Dutch ganseys, I have the book and they’re on my wish list—plus the world needs more bobbles on ganseys! The Inverness pattern is from Gwyn Morgan’s book “Traditional Knitting: Patterns of Ireland, Scotland and England”, p.36. I’ve just opened Gladys again and you and I talked about Matt Cammish’s Filey gansey a while back. This is very handsome and it makes me want to knit one. Gladys will probably win me over once again. By the way, how can I put an image or avatar in my photo box? You have some kind of an icon in yours. Hi again, first of all, icons in comments, I can’t remember how on earth I did it (or how the one or two other people who use them did)—will look into this and get back to you. I haven’t seen the Gwyn Morgan book. Must see if the library has a copy. And another vote for Yorkshire. Yes, Yorkshire is noted for its modesty.